Apple is aggressively hiring new content production executives. The plan relies upon creative talent to develop exclusive shows under the Apple banner. We’re seeing Apple’s first overt steps toward a challenge to Netflix, Hulu, and Amazon Prime Video. Apple released a new “TV” app for iPads, iPhones, and Apple TVs. (It) streams iTunes Store videos, as well as aggregating all shows and movies from third-party streaming services. This lets Apple track views each time a show is streamed to the device. After a decade selling boxes that play other companies’ TV shows, Apple last year started developing and acquiring original TV programs — a tangible major step into content for the hardware and software maker, rumored since mid-2015. Consumer electronics giant Sony made the same move back in 1989 by purchasing Columbia Pictures’ TV and movie studios, instantly becoming a major Hollywood player. Buying a respected studio with existing employees, development deals, and IP is easier than building one from scratch. Thinking differently, Apple decided to build a video content business itself, initially leveraging celebrity relationships bolstered by its 2014 acquisition of Beats. The result was two critically panned TV shows that heavily relied on musicians and actors: Carpool Karaoke and Planet of the Apps. For reasons unknown, another show, starring Beats’ Dr. Dre, has remained under development. As 2017 draws to a close, Apple appears to have changed strategies, aggressively hiring new content production executives and offering prospective showrunners slices of a $1 billion content development fund. The new plan apparently relies upon top TV creative talent to develop exclusive shows under the Apple banner. To that end, three new TV dramas have already been signed. What is Apple’s end goal here? Carpool Karaoke could be understood as a lure for Apple Music subscribers, and Planet of the Apps may have been a way to keep developers focused on Apple’s App Store (rather than, say, Google’s), but Apple hasn’t formally announced a reason for producing TV dramas. Moreover, self-produced TV dramas don’t make sense within the company’s existing distribution or marketing structures — its iTunes Store sales of even top individual TV shows are drops in its revenue bucket. Unlike every other studio’s content, Apple’s two existing TV shows aren’t sold through the iTunes Store — they’re free for Apple Music users to stream. After production costs are taken into account, and with little if any direct revenue from the shows, Apple’s almost certainly losing money every time it makes a new episode. So why earmark a billion dollars for more new original content? This can’t possibly be a gigantic strategic investment to get more Apple Music subscribers. Netflix, Hulu, and Amazon Prime Video, watch out? My best guess is that we’re seeing Apple’s first overt steps toward an open challenge to Netflix, Hulu, and Amazon Prime Video — a move that at least Netflix appears to have anticipated was coming. Last year, Apple released a new “TV” app for iPads, iPhones, and Apple TVs, replacing the 9-year-old Videos app. TV streams iTunes Store videos, as well as centrally aggregating all of the shows and movies currently available from participating third-party streaming services. This lets Apple track views each time a show or movie is streamed to the device. 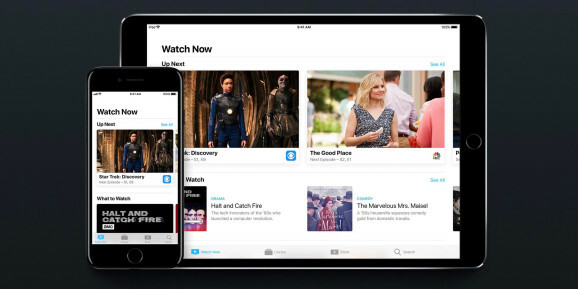 Hulu and Amazon allow Apple to track their streams and integrate their data with the TV app. Netflix notably does not. Apple’s potential threat to Netflix is palpable. It already possesses a giant library of TV shows and movies that can be individually bought or rented, but aren’t available in an “all you can watch” monthly plan like Netflix. Just like Apple Music turned the world’s largest downloads-only audio store into a massive streaming service, flipping that switch on the iTunes video store to create an “Apple Video” service largely depends on new contracts, servers, and subscription plans. If nothing else, the size and quality of iTunes’ video library could upend competitors with smaller and more filler-heavy collections. On the other hand, Netflix is available across multiple platforms, and an Apple Video service might be limited to Apple devices. To truly compete with Netflix, Apple would need to go past its hardware customers to reach Android smartphone and Windows computer users; Apple Music for Android and iTunes for Windows are precedents. That said, Netflix and rivals also reach millions of users through platforms such as Roku, PlayStation, Xbox, and Amazon Fire TV. Apple cannot reasonably expect that its hardware rivals’ customers will buy Apple TV boxes just to stream Apple Video content. The damage Apple causes to Netflix and similar services will depend on whether it’s willing to offer Apple Video widely or restricts it to its own devices. Why does Apple Video seem inevitable at this point? After a year of TV app data collection, Apple surely knows a lot about what people currently like to watch on their devices — minus sports, web content, and whatever they’ve been watching on Netflix. Last month, after previously toying with the notion, Apple added live sports video integration to the TV app, filling in that piece of the puzzle. And from the universal acclaim Netflix has received for shows such as Black Mirror, House of Cards, and Stranger Things, it could easily deduce that new dramas and sci-fi shows are compelling draws for streaming services, too. Only in the context of launching a Netflix rival would it make sense for Apple to fund brand-new shows with serious themes. Last week, the company bought an original sci-fi drama from Ronald D. Moore, the respected sci-fi writer who successfully rebooted 1978’s campy Battlestar Galactica into a gritty space opera and previously wrote for three Star Trek shows. Apple is also funding a reboot of Steven Spielberg’s Amazing Stories, led by Bryan Fuller of Star Trek: Discovery/Hannibal fame, and a “network morning show” drama produced by Reese Witherspoon and Jennifer Aniston. Note that none of these programs has any obvious tie to music generally, or Apple Music specifically. As one might guess from the names involved, these aren’t cheap or trivial financial commitments by Hollywood standards. In each case, Apple agreed to produce two full seasons of the show without a pilot, guaranteeing creators and key actors years of steady paychecks before filming even begins. While the same strategy has paid off for Netflix, securing famous movie directors and actors for TV shows, it’s a huge, risky bet on projects that might be deemed flops after only one or two episodes. Particularly for Apple, which has no existing video subscription service to serve as a hub for multiple new shows, and no obvious TV advertising model in place, spending a billion dollars on original programs only makes sense as part of a much larger bet on streaming video as a whole. When will Apple Video debut? My belief is that we’ll hear something official from Apple on this front in 2018, with a video streaming service launching in the United States, and possibly elsewhere, before year’s end. If we don’t, these investments in new shows will continue to make little sense — unless they’re all planned as musicals.